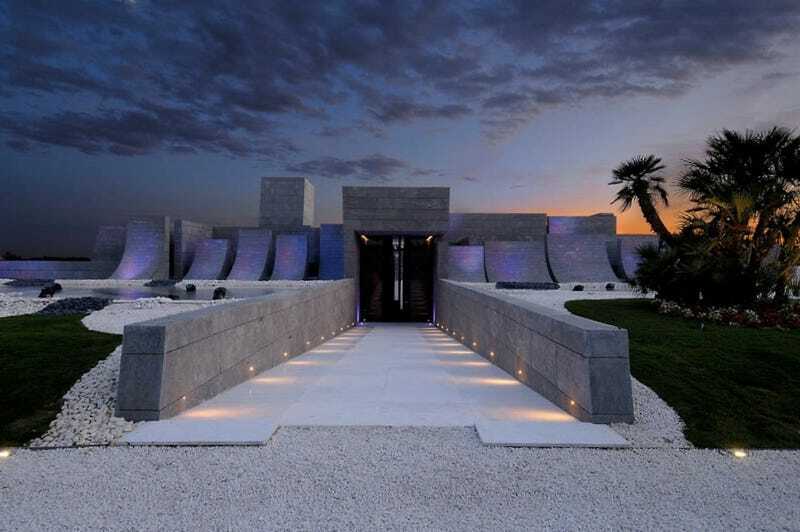 Feast your eyes on "The 1001 Nights House," the latest work by A-cero architect Joaquin Torres. The 2100-square-meter military stronghold single-family home is tucked away in a development somewhere along the outskirts of Madrid, in what Dave over at Contemporist describes as "the suburbs" of Spain. A-cero presents one of its more recent projects in single family properties. It is a single family house located in a development in the outskirts of Madrid. Over a plot of 7000 m2 the building, with 2100 m2, rises with a high standard design answering the owners' requirements. The access, through the development walkway, is placed on a higher level. Here is the property, partially hidden by many curved walls that seem to elevate from some water sheets over a stone covering in white, grey and black shades, placed on purpose as a part of the landscape in this area of the plot. Besides its sculptural features, typical of the A-cero style, this side of the facade expects the integration of the building in the surrounding environment. A wide stone path, with water sheets on both sides, lead us to a huge black glass door that gives us access inside the property. In the garden, following the wishes of the owners, there are palms, pome granate trees and Middle East vegetation. The rear facade of the house, the most visible, makes the most of the slight slope of the plot, where there is the porch, a pool and the garden. Almost all the views from the different rooms of the property are focused here, as the views of the lakes in the common areas of the development. All the building is dressed in "black villar granite stone". In this part of the property big windows, with hidden woodwork, are opened, achieving a lot of light for the inside space. In the porch, the window in the main living room, of 10 meters, is automatically hidden, connecting indoors and outdoors. The passable area is made of white marble, the vase in the pool of blue gressite. The outside furniture is from the Rest collection by A-cero In.